Includes 80mm extension and 30mm backing pad (for hook and loop quick-fastening). For repairs and work in tight places, e.g. on motorcycles, rims, car interior and engine compartment. 80mm extension to reach also deep-lying problem areas. In addition to the extension and 30mm foam support plate, the scope of supply includes wave edged sanding discs each 12 pcs. 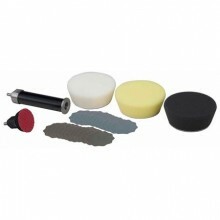 1,000 and 2,500 grit as well as conical polishing sponges each one hard, medium and soft. Click the button below to add the Professional set for finish grinding and polishing to your wish list.